In 1874, at Rocky Ridge, the German Reforms selected as trustees Michael H. Lippy and Edward Long to hold title to a plot of land purchased from Peter Koons for the joint use of the Lutherans and Reformed congregations, for a church and cemetery. The Lutherans selected as trustees, Michael J. Eichelberger and James E. Valentine. The Mt. 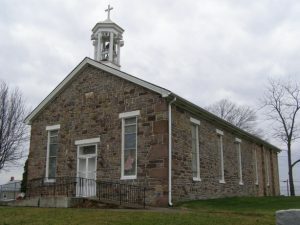 Tabor Congregation was built jointly by the Lutherans and Reformed people in the summer of 1875. The keystone was dated August 22, 1875 and the church was dedicated on September 12, 1875. The edifice was built of stone from the John Ott Farm, about a mile north of the church. In 1881, the name of the church was established as the Mount Tabor Church of Rocky Ridge, Frederick County, Maryland. In 1892, a decision was made for each congregation to have use of the church and grounds on alternate weeks, beginning on Monday and ending on Sunday night. As time past, the congregations grew in membership, improvements were made on the property, and the cemetery was enlarged by additional purchases of adjoining land. On October 28, 1956, a dedication service was held to celebrate the completion of an adjoining Educational Building. Today, the church continues to serve its respective congregations as well as the local community.